Pont Notre Dame is on the other side of the Ile de la Cite from the Petit Pont. 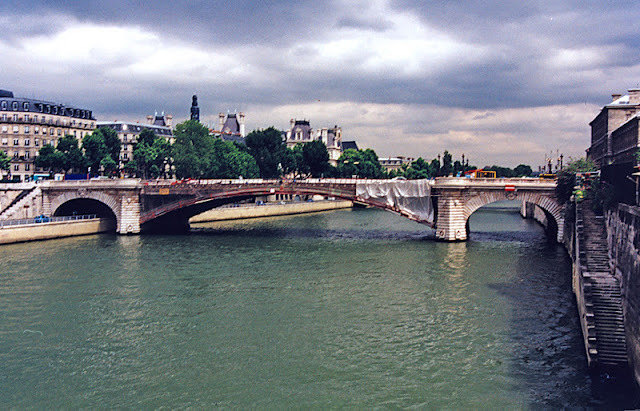 Like the Petit Pont, it has been destroyed and rebuilt many times. It is 105 m (344 ft) long, about three times as long as Petit Pont, and so it was called the Grand Pont until the Middle Ages. The current bridge was built in 1919. It is composed of two 14 m (46 ft) long masonry arch end spans and a 60 m (197 ft) long steel deck arch center span. It is 20 m (66 ft) wide with pedestrian, bicycle, and vehicle lanes. Like most river bridges in Paris, it is highly decorated with heads and statues of Greek Gods, Christian Saints, and French Kings. Like the Viaduc d'Austerlitz, the steel, center span of the Pont Notre Dame was being painted when I took this photo. The problem with metal bridges is that they need more maintenance than stone and concrete bridges. The center span is normally green. Seine River Bridges: Pont Notre Dame by Mark Yashinsky is licensed under a Creative Commons Attribution-NonCommercial-ShareAlike 3.0 United States License.